Cherished by every Russian citizen, the Tretyakov Gallery is rich not only for its artwork but also for the people who work there - those who care for, renovate, study and popularise this priceless collection of Russian art. 2012 MARKED THE 180TH ANNIVERSARY OF PAVEL TRETYAKOV'S BIRTH. ON DECEMBER 27 2012, THE DAY THAT THE TRETYAKOV GALLERY'S FOUNDER WAS BORN, THE CONFERENCE HALL ON LAVRUSHINSKY LANE HOSTED A PRESENTATION OF THE COLLECTOR'S DAUGHTER ALEXANDRA BOTKINA'S BOOK "PAVEL MIKHAILOVICH TRETYAKOV IN LIFE AND ART", A NEW EDITION OF WHICH HAS BEEN PREPARED BY A LARGE AND DEDICATED TEAM. 2012, a year rich in anniversaries, will finish with yet another memorial event, the 180th anniversary of the birth of Pavel Mikhailovich Tretyakov — the extraordinary individual who created the opportunity to come to a national art gallery and to evolve, thanks to it, into "a more Russian, more learned, freer individual". On December 23, 2010 the Pavel Tretyakov Charitable Foundation held for the fifth time its traditional public function dedicated to the memory of the Tretyakov GalleryÕs founder in the museumÕs conference room. Every year, the Tretyakov family commemoration evenings, organised at the national picture gallery by the Pavel Tretyakov Charitable Foundation, focus on a particular theme and characters. On December 18, 2009 the celebration commemorated the 175th anniversary of Sergei Mikhailovich Tretyakov. As the tradition goes, the closing part of the ceremony was dedicated to the oldest museum employees. 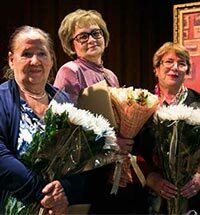 A special event in memory of Pavel Tretyakov was held on December 15 2008 in the Tretyakov Gallery, honoring, according to tradition, the most senior museum employees. Organized by the Pavel Tretyakov Charitable Foundation, the event's date marked two notable anniversaries: the 110th anniversary of the death of Pavel Tretyakov, the founder of the Gallery, and the 125th anniversary of the death of the writer Ivan Sergeevich Turgenev. Dedicated to the Tretyakov family and the great Russian writer Ivan Turgenev this event gave an opportunity to turn to Russian literature, an important part of the Tretyakov family's cultural world. The 175th anniversary of the birth of Pavel Tretyakov was marked by a gala celebration at the Tretyakov Gallery on December 27 2007, organized by the Tretyakov Charitable Foundation.